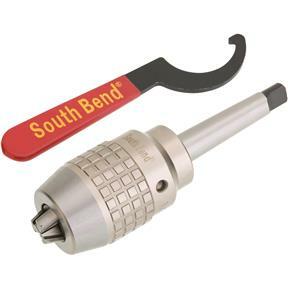 Keyless Integral Chuck MT#2 1/32"-1/2"
South Bend SB1378 - Keyless Integral Chuck MT#2 1/32"-1/2"
These keyless chucks are produced with an integral shank to maximize concentricity between the body, shank and jaws. 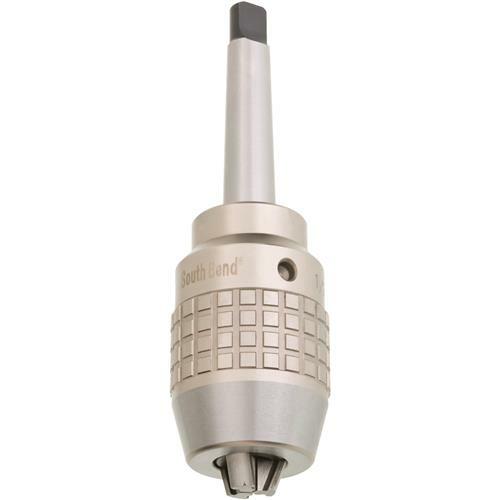 They start as a one-piece high alloy body which is turned, then finish ground throughout, making them as close to zero TIR (Total Indicated Runout) as can be. 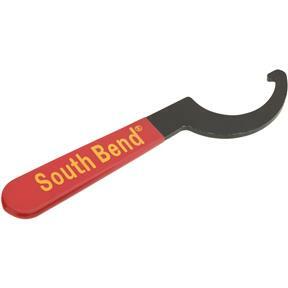 A spanner is provided to ease jaw opening. Don't understand the negative reviews. This is exactly what I needed and it fit perfectly. The only issue I have with this chuck is that it is stiff to chuck up and to release the drill bit. I have to open the top of the drill press and hold the belt front wheel to have enough resistance to release or tighten the chuck. Otherwise it is much better that the chuck that came with the G7944. That chuck had a runout of 0.0055 while this chuck has a runout of 0.002.